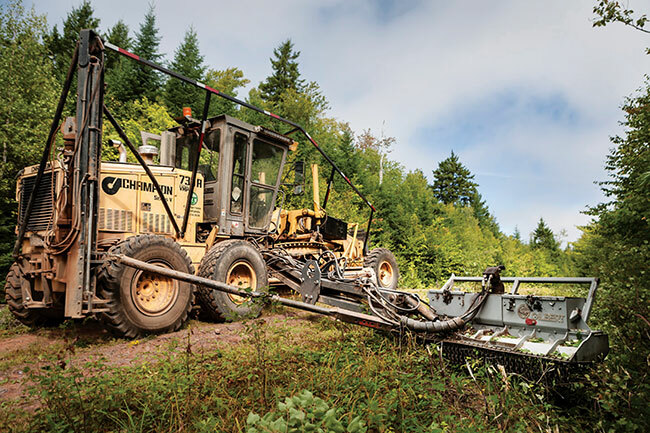 Dec. 17, 2018 – A look at the latest attachments for clearing biomass in Canadian forests. Supertrak’s new product is a SK170MX 170-hp 4.4 Tier Four Final single engine, dedicated closed loop system feeding a mulching head with 50 GPM flow at 5500 PSI. This machine has all the dedicated cooling and reversing fan systems that are needed in the industry to cool the machine. All this is packed in a 313F frame, estimated weight 35,000 lbs. with a head. With 4.3-4.5 PSI with 28-inch triple grouser pads, this multi-function machine can adapt a wide range of head and tool options. Components and design have been adopted from the already proven SK170RTL and power packs into the new machine. Adding a rotary mower BrushCutt attachment to your preferred carrier machine will help you maintain fence lines, improve pasture land as well as lane and road side weed control and rough cut grass cutting. The BrushCutt Rotary Brush Mower features reversible/replaceable blades that are made of long lasting 0.25-inch AR 400 steel. Four blades come standard on the 500 Series rotary brush mower for tractors and skidsteers and three blades on excavator models. The curved cutting tips of the slasher blades give the BrushCutt two cuts per pass of each blade. 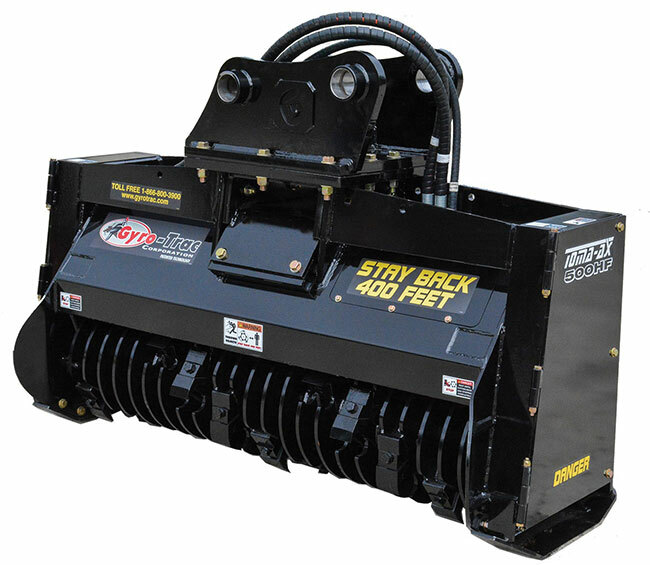 Gyro-Trac’s 500 HDM mulching cutter-head quickly attaches to any heavy-duty excavator or track hoe. 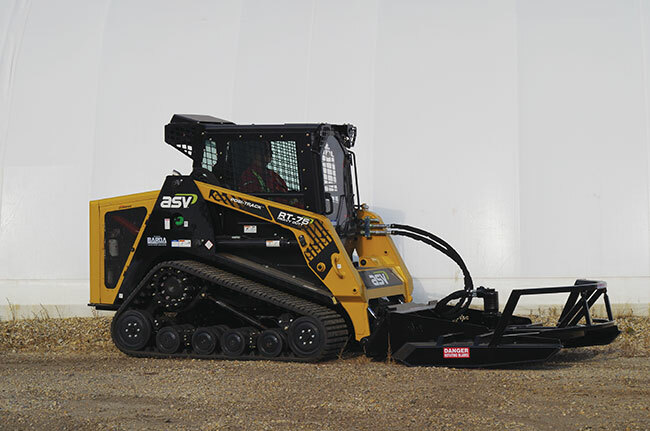 Remove a few bolts and it reveals a standard quick-attach for any high-flow skid steer or compact track loader. It is rated for 80-140 hp. If you add the optional second hydraulic motor, it is rated to 250 hp. Gyro-Trac manufactures tracked mulching machines from 140-350 hp and high-flow and low-flow attachments for prime movers, skid steers, excavators, tractor booms and small track-hoes. The patented Sabre Tooth cutting technology is the world’s most productive and efficient. Gyro-Trac’s NEXUS Service Platform disrupted the heavy equipment service model. The Gilbert GM-6 brushcutter-mower is an innovative brushcutting attachment for road graders and carriers. The cutting head is mounted on a folding boom arm, which offers excellent manoeuvrability with a total reach of 16 feet. It is the ideal tool to brush cut ditches, back slopes and trim the trees as required on forestry, municipal, secondary roads, etc. The GM-6 is the most cost-effective roadside maintenance piece of equipment. It easily cuts stems up to eight-inch diameter at an average operating speed of six km per hour, thanks to the patented concept that cuts vegetation as opposed to mulching it. Denis Cimaf DAH mulching attachment for five- to 35-ton excavators is the most efficient mulching head in the industry. The DAH models range from the DAH-065B, for five- to eight-ton excavators, to the DAH-150Er, for 27- to 35-ton excavators. They can be installed on all mast-type hydraulic carriers with sufficient hydraulic lines, weight and power. The main advantages of this model lie in visibility, versatility and mobility. 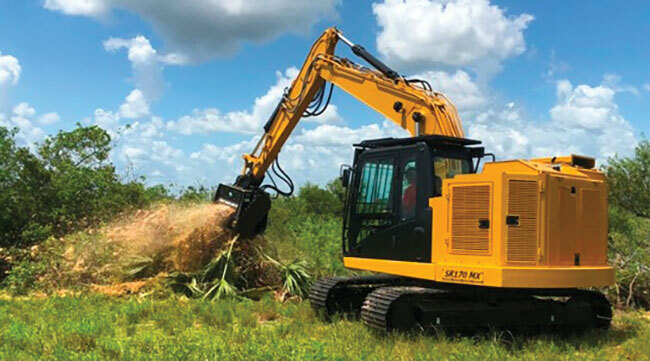 With the wide ranges of excavator choice and the mulching feats of the DAH, there is no job too difficult for land clearing or right-of-way maintenance business equipped with a Denis Cimaf mulcher. 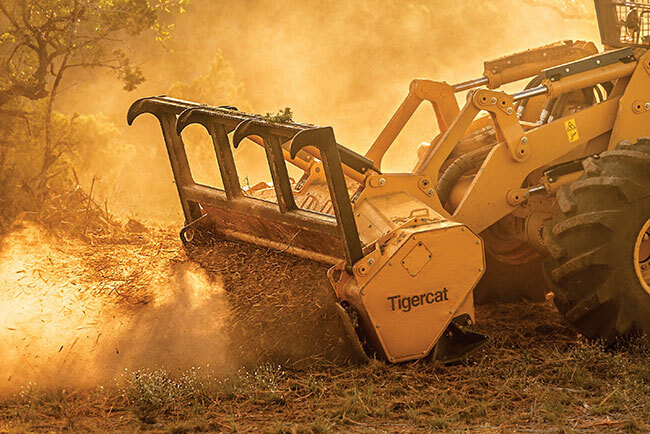 The 4061 mulching head is manufactured to Tigercat’s exacting high standards for robustness and quality. The housing features reinforced side covers and abrasion resistant skis. The housing is optimized with debris door cylinders mounted internally for protection and contains position references to aid in ski alignment. Timing belts eliminate belt slip and provide efficient power transfer to the rotor, lowering maintenance time and costs associated with conventional v-belts. Service and maintenance are a snap, maximizing uptime. The Tigercat designed tooth and holder system uses a taper lock interface that requires no torque wrenches, greatly reducing changeover time. The teeth are extremely durable with carbide tips and carbide inserts for increased life. 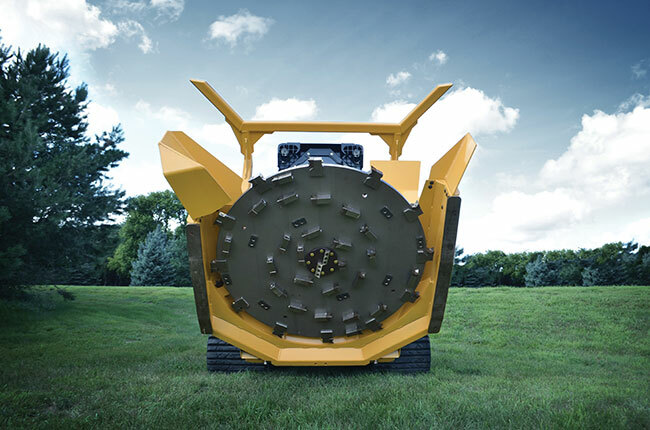 The John Deere MH60D mulching head was designed to remove eight-inch trees and 12-inch stumps in just minutes. Optimized to work with John Deere skid steer loaders and compact track loaders, the MH60D features superior large-material knockdown and tackles below soil level for removing difficult stumps. The two-speed hydraulic system automatically shifts when the preset pressure level is met, increasing torque for reduced stalling and faster rotor-speed recovery time. A prominently positioned pressure gauge allows operators to easily monitor hydraulic operating pressure, and the redesigned mulching chamber enables efficient material flow and reduces wear points for optimized shredding performance. Diamond Mowers’ heavy-duty equipment is the toughest, safest, and most reliable in the business. Diamond’s Forestry Disc Mulchers are ideal for large mulch and brush management applications. 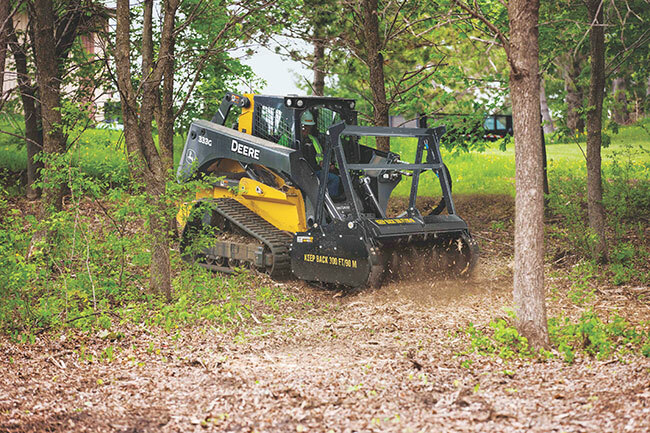 The Forestry Disc Mulcher attaches and detaches easily to your skid-steer or compact track loader to add versatility and productivity to your existing asset. Available in a 60-inch cutting width it can cut material up to 14 inches in diameter. 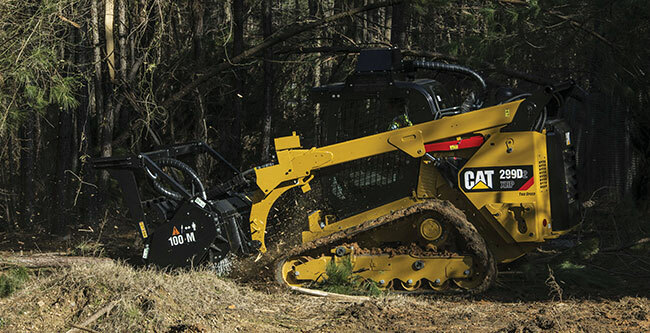 Caterpillar offers two types of attachments for managing and removing vegetation and undergrowth from wooded terrain. 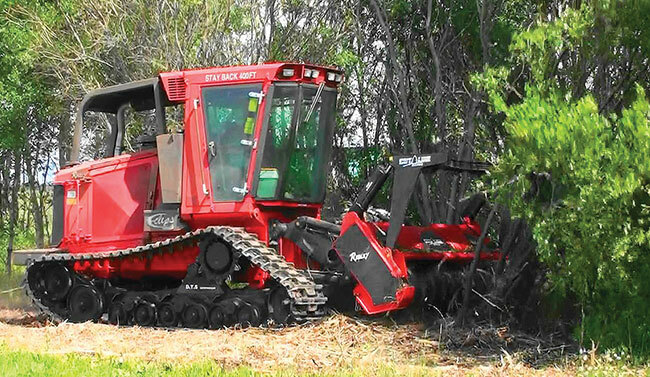 Both attachments reduce saplings, shrubs and trees into wood mulch. The Cat C Series Mulchers are attachments for skid steer loaders, compact wheel loaders, and similar machines as well as mini hydraulic excavators. The Cat HM418C, designed for loaders, is the largest in the C Series Mulchers with a working width of 72-inches. 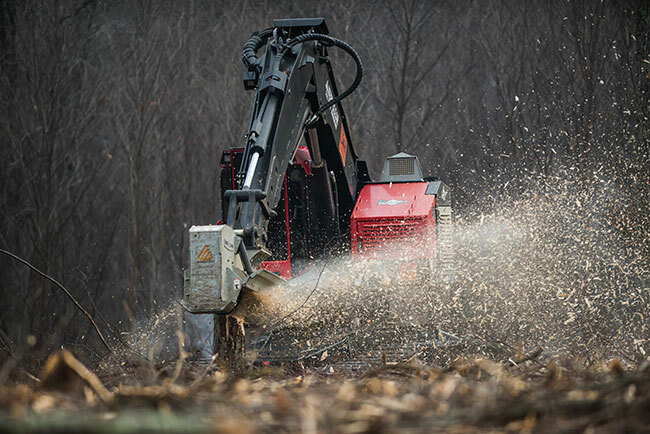 Like other attachments in the C Series, it can process trees up to eight inches in diameter. 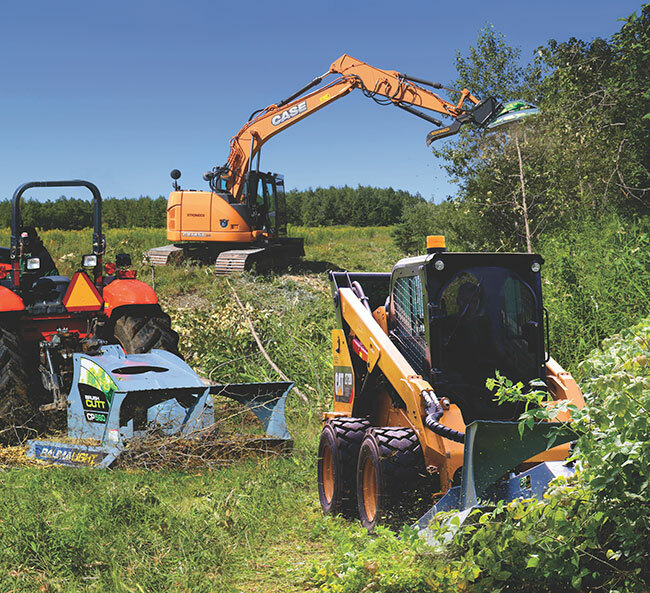 Risley Equipment Inc. designed the E-Clips EX300 multi-purpose brush-cutter, mulcher and stump grinder to be the next generation of multi-purpose track machine. The E-clips offers high speed mobility with integrated DTS suspension and a revolutionary full motion Flex-Trac pad, which eclipses traditional rail based track undercarriages. E-clips includes the ability to transform effective hydraulic horsepower to Risley’s own line of CutLine cutter, mulcher, and grinder attachments. Equipped with the latest technologies in engine, hydraulics, and man-machine interfaces, the E-clips sets a new standard in efficiency with brand leading components such as Cummins, Sauer-Danfoss, Rexroth, and Flexxaire. The E-clips can be configured as a loader or tractor configuration. Its design offers the flexibility to change its configuration to meet individual resource needs. For efficiency and money-making productivity you want to make that selection based on what you’ll be cutting, the terrain, desired end results, and ultimately, the cost per acre cleared. Davco Brush Cutters are hard to beat when you’re clearing vegetation. This heavy-duty brush cutter is fast cutting, easily mounted and is low maintenance. Davco Brush Cutters use tremendous flywheel inertia generating torque and do not require a high RPM to give it its optimum cutting speed. Satisfied customers with a Davco and drumstyle heads have said they choose to use the Davco because it’s faster and more economical to run.